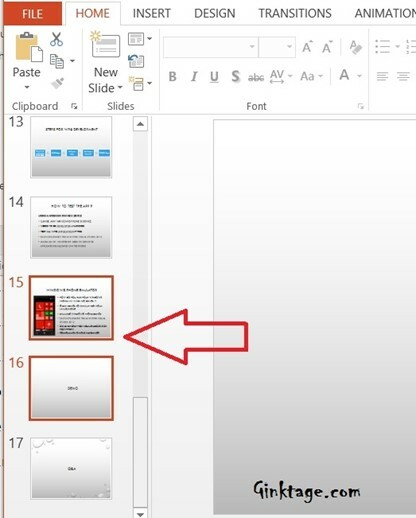 How to add Duplicate Slide in PowerPoint 2013 Presentation? 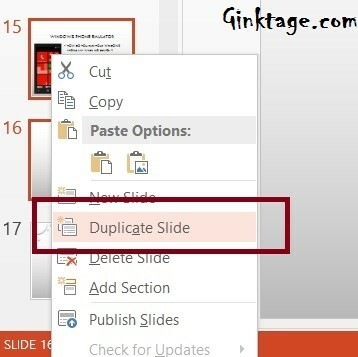 This article will explain how to duplicate slides within your presentation in Microsoft PowerPoint 2013. 1. Launch Microsoft PowerPoint 2013. 2. Open the presentation file. 3. In the Outline section (Thumbnails), select the slides that you want to duplicate. 4. Right Click on the selected slides and click “Duplicate Slide”. The selected slides are duplicated and inserted to the PowerPoint presentation.